Climate change over time happens by definition. The challenge is to determine the time period over which change occurs. Imagine for a moment that you are a rock. 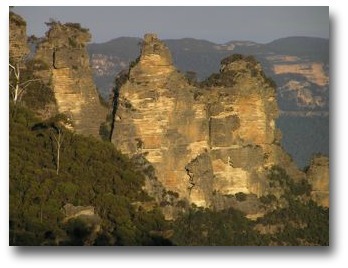 Not just any rock but a sandstone boulder high on the iconic formation called the Three Sisters in the Blue Mountains, west of Sydney, Australia. You have, for millions of years, gazed out across the valley below and watched it steadily grow wider and deeper. The trees on the valley floor have come and gone many thousands of times. Recently they changed colour generating the blue tinge that gives the area its name. This is because Eucalyptus species became dominant in the vegetation, a response to increased fire frequency in the drier times of the last few millennia. At the moment the climate is warm in summer, chilly on winter nights and occasionally cold enough for frosts and snow. Even though you are near the top of the cliff, these mountains are not high enough for the snow to stick for more than a day or two. Some time ago it was much colder but it has also been wetter and hotter. In fact in your millions of years of taking in the view you have seen just about everything the weather can deliver. There have been hundreds of thousands of rainbows, there have been torrents, droughts and countless rain showers. Seeing it all at leisure is one of the benefits of being a rock. Rocks are around long enough to observe the climate change. Has the science had long enough? Science has been able to take direct readings of climate indicators for 120 years or so for the easy measurements, less for those requiring technologies. Including for global temperatures. This is barely a wink in the lifetime of the Earth's climate. Modern humans have only been around for about 160,000 years. This is less than 0.005% of the 3,500 million years life has existed on Earth. And 100 years is less than 0.06% of duration of modern human existence. It really is a blink. The atmosphere has been there doing its thing for longer than we can imagine. 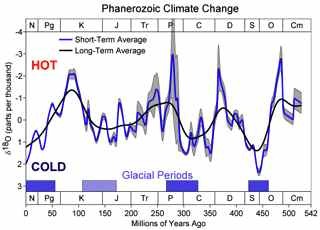 Examination of indirect indicators of climate in ice cores, using radioisotopes and from pollen records in lake sediments suggests that the world has been both colder and warmer than it is today. 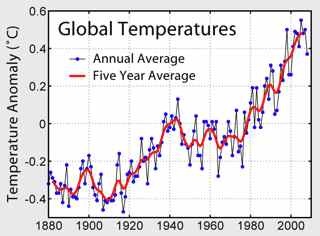 There is nothing unusual about climate change over time.